There's a thin line between effectively taut triathlon attire and plain old uncomfortable. 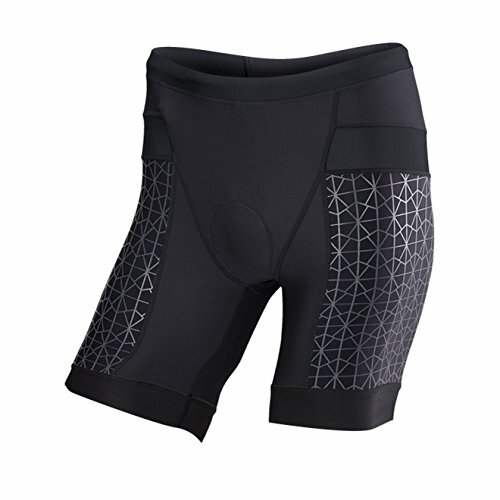 And while you might be tempted to think that the TYR Men's Competitor 7in Tri Shorts is just another sheep in the herd, the Competitor is designed specifically for triathlon performance. To start, the Competitor features a gentle compression webbing that stabilizes key muscle groups during the swim, bike, and run stages. Throughout the short, Competitor Woven fabric is ultra-light, soft, and stretchy. Not to mention, it also dries immediately once you leave the water to prevent irritation during the following stages. Meanwhile, mesh inserts pull perspiration away from your skin for enhanced cooling on sweltering race courses. And to shield your legs from scorching UV rays, UPF 50+ ensures proper protection on the sunniest days of the year. Though, perhaps most importantly, the integrated Competitor chamois softens saddle pressure during the bike stage, yet refrains from being bulky or inflexible when you're swimming and running. Consequently, the pad's multi-directional stretch, breathable material, and male-specific shape increase some semblance of comfort through all three stages. Other race-friendly features include a rear zippered pocket for carrying your energy gels, a stretchy drawcord waist for a secure fit, and silicone bead grippers to prevent the bottoms from migrating.